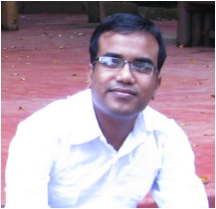 Rahul Deb, MS in chemistry from Assam University Silchar, India in 2006 and carrying out Ph.D. programme with Prof. Nandiraju V S Rao, in the area of design and synthesis of achiral four-ring bent-core liquid crystals exhibiting banana and nematics phases. Most of the designed compounds are novel and exhibit splay modulated B7 and B1 phases and nematic phases with chiral domains. 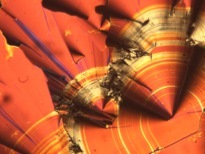 Some of the bent compounds and their complexes exhibit cybotactic nematic phases with unusual POM textures. Currently he is visiting Department of Organic and Polymeric Materials, Tokyo Institute of Technology, Ookayama, Japan with the Global Centre of Excellence fellowship to carry out X-ray studies, electro-optical studies, switching current measurements under the guidance of Professors Hideo Takezoe and Ken Ishikawa. In context of study of liquid crystalline compounds phase determination is very important. This texture shows focal conic B1 type liquid crystalline phase (20 micron sample) exhibited by a four ring unsymmetrical banana shaped mesogen. The molecular frame work of the compound incorporates imine-ester linkages. The texture was taken in the temperature range 140-141°C under crossed polarizers with a 20x objective in Nikon ECLIPSE LV100POL microscope with Olympus C5050 digital camera. Jury comment: copper turnings - in 2D.